The CA 19-9 test measures the CA 19-9 blood level. What is the CA 19-9 test? The CA 19-9 blood test measures the CA 19-9 blood level. Why is the CA 19-9 blood test important? The CA 19-9 test is sometimes elevated in the setting of gastrointestinal tumors. This CA 19-9 Test is a blood test. The CA 19-9 test, also known as a CA 19-9 blood test, carbohydrate antigen 19-9 test and CA 19-9 lab test, measures the CA 19-9 blood level. CA 19-9 is a blood marker that is sometimes tracked in people with cancer of the pancreas. Also called cancer antigen 19-9 and sialyated Lewis (a) antigen, CA 19-9 is named from how it binds to a specific tumor marker. Many cancer organizations recommend using CA 19-9 as more of a tracking (rather than screening) marker for pancreatic cancer. Used in this way, CA 19-9 blood levels should decrease as a pancreatic tumor decreases in size as CA 19-9 is typically released by the pancreas. CA 19-9 levels can be elevated in other types of gastrointestinal cancers as well as bile duct disease. A small percentage of people do not produce CA 19-9. CA 19-9 lab results are typically reported in U/mL units. To get a CA 19-9 test near you, order online and get tested at the Quest Diagnostics location you selected to get your blood drawn. Once your CA 19-9 lab results are ready, they will be available for download. 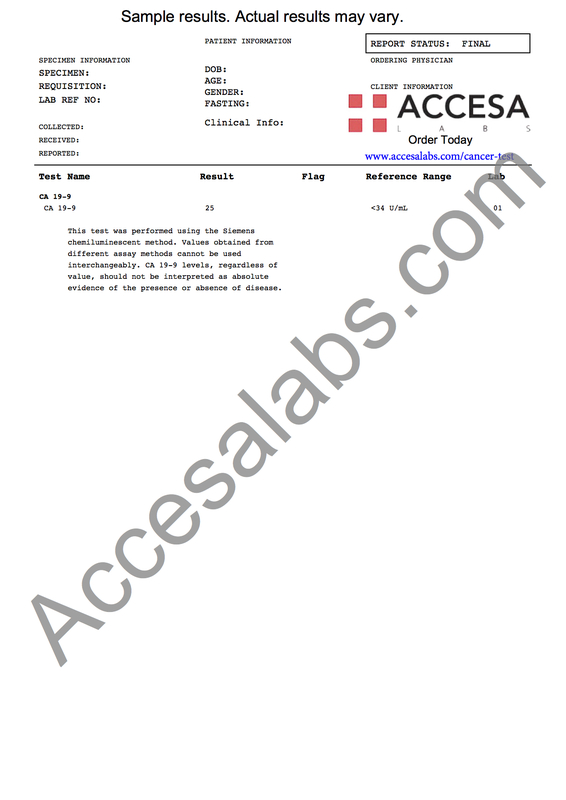 As can be seen on the sample CA 19-9 lab report above, the CA 19-9 blood level is reported as a number and can be compared against the reference range provided by the lab. The CA 19-9 level is also sometimes used to monitor for disease activity or to assess the risk of relapse following treatment. CA 19-9 blood levels cannot be used in isolation as absolute evidence of the presence or absence of a disease and all results should be evaluated in conjunction with a licensed medical provider. The CA 19-9 blood test is sometimes ordered with other cancer markers such as the AFP test, CA 15-3 test, and the CEA test. CA 19-9 Test at Guaranteed Prices.